Sandy Berger was sentenced to two years of probation, 100 hours of community service and a fine. Judge Robinson had presided over the “Scooter” Libby indictment. Libby was sentenced to 30 months in jail. Robinson may have had little to do with that final outcome. And may have had limited control over the eagerness of some in the DOJ to give Sandy Berger a pass. If nothing else, Robinson did end up raising the fine that Berger had to pay. But Berger still got a slap on the wrist and Libby didn’t. FBI Director Christopher Wray had announced the slap on the wrist for Berger in his former capacity as Assistant Attorney General. And had declined to discuss the investigation while in progress. President Bush had wanted action, but the FBI had cheerfully dismissed the seriousness of the investigation. And that’s just the way that it seems to go for Democrats and the way that it is for Republicans. It’s not hard to see why. Take Judge Beryl Howell. Howell is an Obama appointee and a former Leahy adviser. Beryl and her husband are both Dem donors. She’s also a pal of Obama’s former DOJ boss, Lorretta Lynch. And of Andrew Weissmann. Weissmann, an Obama donor, is a key member of Mueller’s team. And Judge Howell gave Mueller his grand jury and decided that Manafort wasn’t entitled to attorney-client privilege. It was an extraordinary and troubling decision. And its legitimacy can’t help but be questioned when it comes from a partisan Dem figure. It was seemingly Weissman, Howell’s old friend, who decided to shred Manafort’s attorney-client privilege. And Weissman has been described as being very friendly with Loretta Lynch. “Absent the good will of his friends Loretta Lynch and Bob Mueller, it is inconceivable that his DOJ or FBI career would be have been resuscitated,” a former prosecutor was quoted as saying. Manafort may be guilty, but it’s not hard to see the problem with an opposition party, prosecuting, trying and convicting its political opponents while exonerating its own operatives. The Mueller team already includes no shortage of Clinton and Obama donors. Jeannie Rhee is a Clinton donor who represented the Clinton Foundation. Aaron Zebley had represented Justin Cooper, a senior Clinton adviser, who helped run Hillary’s email server. James Quarles, Rush Atkinson and Elizabeth Prelogar are Hillary donors. Andrew Weissmann and Brandon Van Grack are Obama donors. We now know that the Trump dossier that got the ball rolling originated with the Clinton campaign. The charges against Manafort have nothing to do with Trump, yet Trump is the reason for the entire affair. The investigation and the trial are the end products of an investigation touched off by the Clintons, that is being managed by Democrats and is being overseen by Clinton and Obama loyalists. There is no possible way that such proceedings won’t be seen as fundamentally tainted. The only way to have conducted a legitimate investigation in a partisan atmosphere would have been to minimize the role of partisan figures. Instead their presence has been maximized. And that’s the kind of behavior that people associate with rigged cases. As the latest DNC revelations show, the Clintons are no strangers to rigging the game in order to win. And their fingerprints are all over this. It’s no secret that the endgame of this investigation is Trump’s impeachment. The Democrats have made it clear that impeachment will happen as soon as they get their majority. Whatever the investigation turns up will be used as grist for impeachment proceedings. 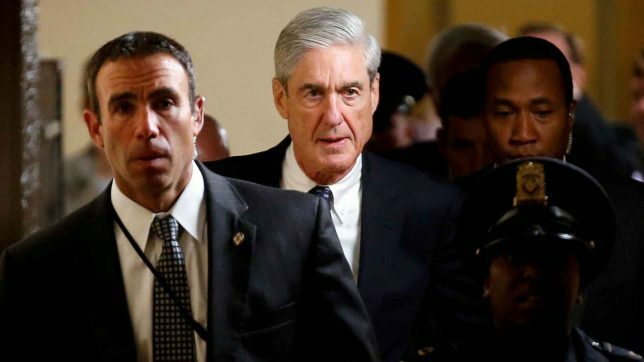 That makes the investigation the third leg of the tripod that began with the Clinton campaign’s Russia dossier, that continued with Obama’s eavesdropping on Trump officials and that has now evolved into criminal proceedings. The tripod’s legs may point in different directions, but they began in the same place. They’re all efforts by Clinton and Obama associates to rig the election and, when that failed, to overturn its results. There’s a term for unelected officials deciding to remove elected officials from office. It’s a coup. If the Dems really thought that their investigation was legitimate, they wouldn’t have needed to stack the deck with their people. Nor would they be utilizing crude and ruthless tactics that are completely out of proportion to the offenses in question. By rigging the game, they are guaranteeing that the majority of Republicans will not accept the outcome. But that doesn’t matter to them. The Dems have decided that they want to win elections at any cost. They are willing to win them at the cost of eavesdropping on their political opponents and forcing them out of office with criminal investigations. And they are clever enough that these tactics may be technically legal. The Obama version of Watergate was so cleverly executed that few, if any laws, were probably broken. Mueller’s investigation will produce results that will probably fall apart on appeal, but will deliver immediate material to his political allies who are trying to achieve regime change any way they can. But the technical legality of these tactics doesn’t change their inherent destructiveness. Your neighbor may find a technical legality for seizing your house, but that doesn’t mean you are likely to accept the fairness of his actions. Individuals have limited recourse against technically legal, but blatantly unfair abuses of power. The same isn’t true of half the country’s voters. Democrats have spent so long being the government party that they have lost sight of the limitations of government power and the resentment that the possession of it stirs up outside Washington D.C.
Rather than understanding Trump’s victory as a backlash against establishment power, the political establishment is trying to squelch it with even more abuses of power. And it imagines that half the country will accept the outcome because the establishment is playing by its own rules. That may prove to be its worst mistake yet. Countries are run by consensus. People accept laws that are the product of the consensus. They will overlook abuses in the system as long as they feel that they have some sort of voice. Trump’s win was the backlash of people who felt that they no longer had a voice. Establishment figures depriving them of their voice through underhanded tactics will only prove them right. And lead to a far worse backlash.